Is this one of PRX 62 any use ? Interesting looking monitor! Does anyone know its type and purpose? Even the big locker attached to the turret is unusual. Finally a question for Ian who submitted this photograph - "When did MerryWeather TLs become aerial appliances?" When he was a boy they were definitely TLs. Added by Barry on 15 January 2008. Fao Ian, Thank you very much for posting this photo, My mission in life is to find this Appliance and hopefully own it one day (if she is still around!). Bonus is the wife loves this beast!! Added by Chris Whitton on 15 January 2008. I didn't caption it as an aerial appliance, and it's still a TL so far as I'm concerned. 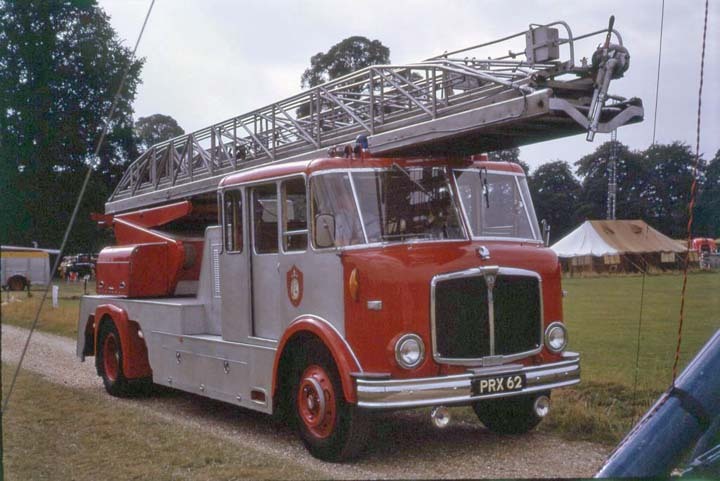 As regards the ladder itself, don't forget that it was the one from the Leyland TD7, GLW 420. Added by Ian Moore on 15 January 2008.
the monitor consisted of an "A" type "Streamform" branch with a 30mm nozzle and 70mm pipe on the underside with a male instantaneous coupling, it could be moved side to side horizontally and up and down verticaly within limitations, it was operated manually or by ground control lines. The "locker"is the two-way hands free telephone to communicate with the operator. powered by a B.M.C.diesel engine. I used to drive and operate this appliance whilst it was in service with Berkshire & Reading Fire Brigade. Added by alan jones on 15 January 2008. Fao alan j can I ask when you served with b&r fire brigade, reason being my dad was stationed at caversham rd. Alan, thank you for such an informative reply. I was surprised that it had a separate full time 'telephone' system to the head of the ladder. I would expect that this is in addition to the standard system which is part of the operators console and was perhaps connected through the standard external telephone socket. I do think that this site is very good. Where else could a black and white photograph lead to a picture of the machine in preservation and then the very TL operator can write in and tell us all the exact details. Added by Pete Matten on 15 January 2008. Added by John Walker on 16 January 2008. This photo was taken at the "englefield park"rally in 1972 when P R X was still on the run, the guy in the o.i.c. seat is known to me. It was replaced by a 25metre Orbitor/Dodge hydraulic platform. Added by alan jones on 16 January 2008. I beleive this photo was taken at "englefield park" rally in 1972, the guy in the o.i.c. seat is known to me. PRX 62 was still "on the run"
John, I remember Devonport had one or two AEC pumps, they were quite unique as on our side of the Bridge no such appliance existed to my knowledge. There must be an interesting story to their purchase. I believe EX 9217 went to Fiji and EX 9218 to Palmerston North. Wellington may have had some on their front line back in the sixties too? Yes, you have to pull out all stops to get this one! Good luck. Added by Pavel - Western Australia on 11 February 2008. Added by John Walker on 14 February 2008. Would either of you have any knowledge or record of this appliance history since it went out service in 1972. I would appreciate any info you may have. Added by Alan Jones.ex Berkshirea on 26 March 2010. Sorry Alan,at this time without doing a little more research,I can't add anymore than whats been already added hear.Maybe Ian can help us out on this one?.Pete. Added by Pete Matten on 26 March 2010. This is a message for Chris Witton, I am pleased to report that PRX62 still exists and I was looking at the vehicle yesterday! I can also report it is for sale, the good new deteriorates slightly as the vehicle has stood for some time and will need full renovation but as far as I can tell it is complete. Please contact me for details. Added by Neil james on 14 May 2014. Added by Craigw on 05 March 2015. This appliance is now on Ebay at £3, 000 and looks in need of a lot of TLC. Added by Richard Aston on 03 January 2016. Have just seen the series of photos on e bay, appalling sights. Memories of driving and operating this magnificent machine made the sight of its condition even worse! Looking at what is left so many items missing are irreplacable without the rest of work to be done. Today, one sad man has come to the end of his quest to find PRX 62 , although she remains defiant with her brake STOP flags in warning position, it's only failing!!! Added by Alan Jones,ex BERKSHIRE on 07 January 2016. Added by BOB CARVER on 10 April 2019.